I began the week with Week 7 Day 1 of the 10k Runner app. I’d tried to do it the week before but found it so hard – I thought it would be a good idea to get comfortable with it before moving to the next level. 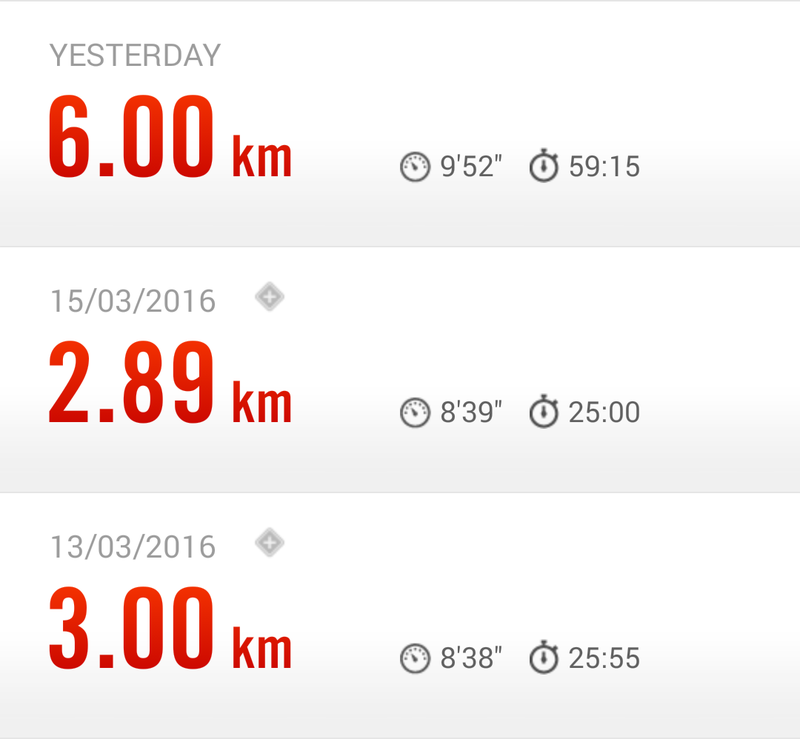 I alternated between 6 km/h and 7.2 km/h and struggled again. And that was it. I did some stretches and went home. I went back to the gym on Tuesday for Week 7 Day 2 of the 10k Runner app. I struggled again and thought I might have to repeat the week again the following week! Does running ever get any easier?? Well, the ‘Macarena’ plank is nowhere near as fun as it sounds. In a plank position, on my hands I would have to lift one hand and touch the opposite shoulder and do the same with the other hand. I’d then have to lift the first hand and touch my hip on the same side and then do the same thing on the other side. I could actually hear the song going round in my head as I was doing it. Oh God – I was ready to go home. I had another 4 minutes on the cross-trainer, alternating fast and slow speeds and I was finally done. I did some stretches to finish and went home. On Thursday morning I went to a Hatha Flow class at Eco Yoga Sanctuary. They had a special offer on – 40 classes for AED 1999, valid for a year. I decided to buy it – I like going there and most of the teachers I’ve had are good. I took the day off on Friday. I’d been working until really late on Thursday night and hadn’t slept very well that night. 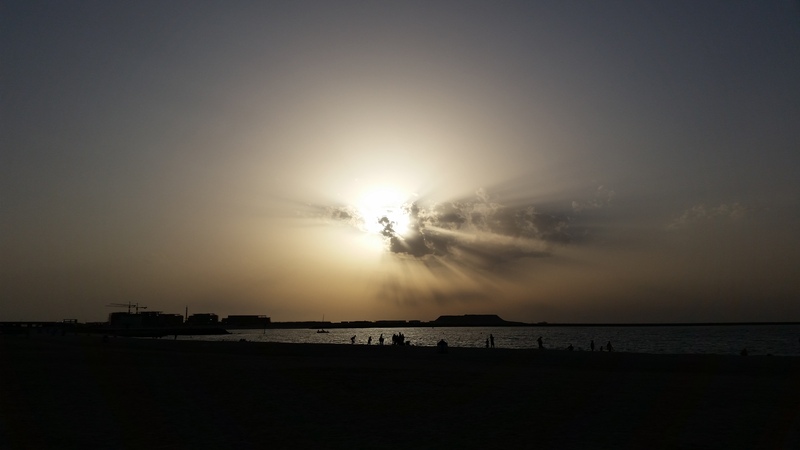 On Saturday my friend and I made it to the beach for our evening walk. We started a little before 6pm – it was such a beautiful evening. We did our 6 km in just under an hour. And because we weren’t trying to improve on our time, I think it was easier on my knees than previous weeks. Low point of the week? I didn’t get to Day 3 of Week 7 in the 10k Runner app. High point of the week? Doing six workouts this week, including the 1-hour walk on the beach. I also met a friend on Tuesday evening after almost three months – he told me I’d lost a lot of weight! Weight loss? It was nice seeing 75 kg a few times this week. 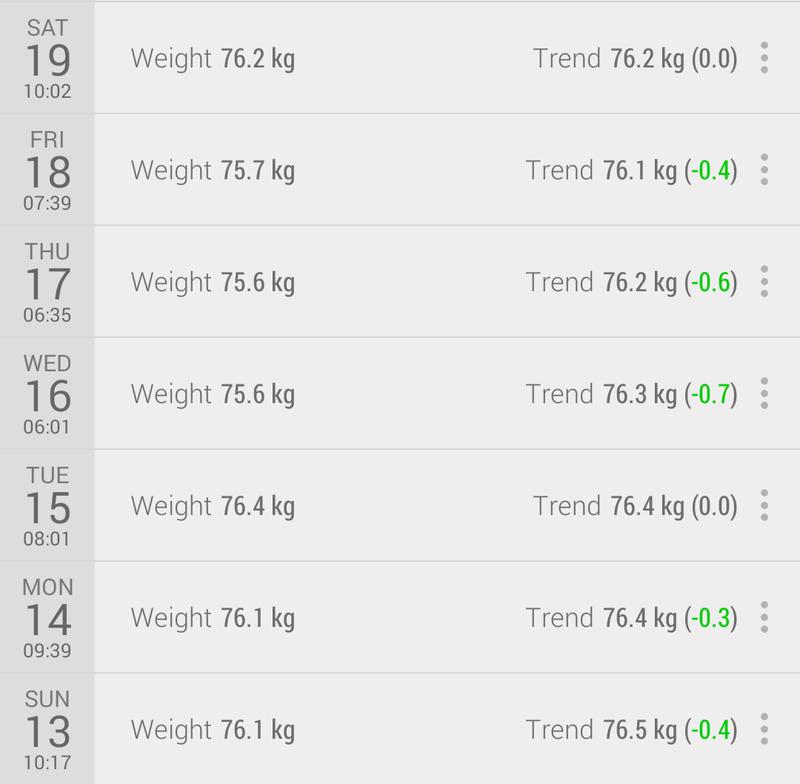 My Libra weight-tracking now tells me I’ll hit my goal weight of 65 kg by the end of November this year!